Check out how many calories in Crab Salad over Lettuce. Get answers to all your nutrition facts questions at FitClick. Description: Crab meat salad over lettuce with chives. 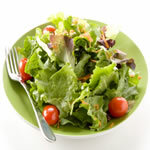 Tip: For nutritional information on all the ingredients in Crab Salad over Lettuce just click on each ingredient name. Then adjust the serving size for any Crab Salad over Lettuce ingredient with the serving size tool in the nutrition facts area to the right to see how you can save calories, carbs and more. Combine mayo, sour cream, milk, chili sauce, green onions, red peppers and lemon juice. Whisk together to make dressing. Add 1 cup lettuce per serving bowl. Mix dressing with crab meat chunks. Add crab mixture to lettuce and sprinkle with chives. Find more recipes like Crab Salad over Lettuce. FitClick has over 60,000 foods and recipes with detailed nutrition information to view. I prefer fresh crab, not imitation. Not a fan of the crab.